Is it possible, and how would I go about changing the position of the frets of an electric guitar, for example making some frets a quarter tone sharp or flat? As another more difficult example, would it be possible to slightly correct the pitch of one fret by moving it by a distance on the scale of millimeters? The reasoning behind this is that I'm really interested in microtonal music, not necessarily quarter tonal. There are a lot of cool equal temperament tunings that I can choose from, and some would very probably require placing some frets very close to where there is an existing one. I could just leave them slightly out of tune because I'm not familiar with microtonal tunings anyway, but if I'm doing this I want to do it a bit better than that. Tolgahan uses variable fret positions for microtonal reasons and for playing with differing intonations and temperament. See this video for an example. As you can see, his technique has been to insert slots allowing each fret-let to be moved independently of the others. As he points out in one of his videos, this is not easy, so I wouldn't recommend it if you don't need it. Yes, you can absolutely make tiny pitch changes by moving frets. A quick Google search found plenty of fretless guitars. These should let you play any fraction of a semitone. For a limited range, you could use non-standard tuning and raise or flatten a string by a quarter tone. Then using two strings, you could play super-chromatically. For a quarter tone super-chromatic scale you would need to alternate between two adjacent strings. Of course, by tuning some strings close together, your total range would be reduced. It's quite possible, and doable, although I can't see why.Given that the sonic distance between one fret (any fret) and the next is a semitone, taking the higher fret wire out and cutting a small slot with a hacksaw exactly half way between will give the position for a quarter tone note. Millimetres on the lowest frets, perhaps several thous on the upper ones. For setting up quarter-tone divisions, and even down to realizing alternate temperaments, you probably do not need to remove the existing frets; i.e. you don't need to "move" the frets, just add additional ones at the appropriate places. 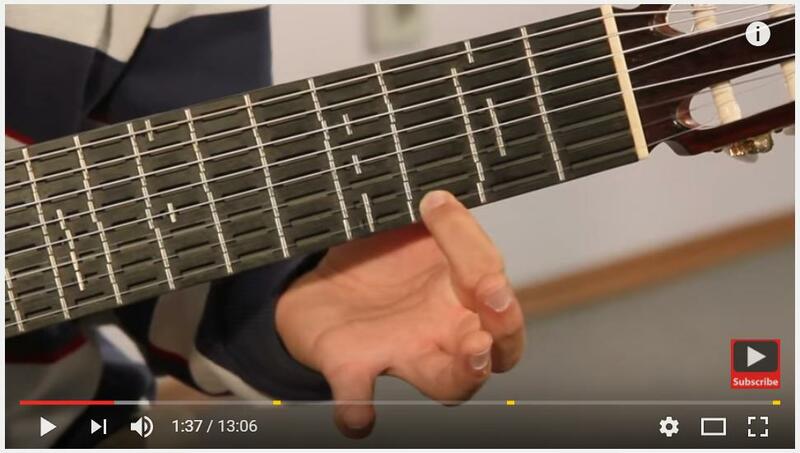 This process of placing (partial) frets between the existing ones has been demonstrated to be practical by Tolgahan Çoğulu, see this video, and related content. For your smaller scale problem, shifting the point of contact between the string and the fret by a millimeter or two can probably be accomplished by installing custom shaped frets within the existing slots. By shaping the frets to peak at one side or the other, instead of being symmetrically crowned. Note that this degree of tone adjustment can probably be effected by just pressing harder, pulling on the string (along the neck) or bending the string (across the neck) without modifying the frets themselves. Installing additional frets is a fair bit of work and you really should have some experience in fretted instrument repair and construction. Assuming you have that, consider approaching this the way it's done on a harp. If what you really want is to be able to play exact 1/4 tones or some other absolute value, consider creating a device to sharpen each string exactly by 1/4 tone by changing its tension. Something like a mini-tremolo-bar for each string, but with a fixed, lockable position. This will allow you to sharpen any or all of the notes on each string with a single operation, rather than requiring you to install many, many new frets for each string. This also avoids the issue of "how wide is each fret". If you're not sure what I'm describing, find a friend with a harp, or research harp construction. A trade off of course, is that when playing you have an additional movement to make each time you want to switch from 'sharped' to 'non-sharped' on a string. Concert harps do this with a convenient foot pedal, simpler harps have a lever by the tuning pin for each string. My wife plays the pipa, which has lots of awsome frets going all the way down the body, not just the neck, and I say awsome because the ones on the neck are huge chunks of cow horn or obsidian, not just little wires. Anyway, the low-end instrument I got her to rekindle her interest developed a creep or bend in one end of one fret and it was a little off. But, she can compensate by pushing to one edge and rolling her finger off the fret and onto the string, essentially holding it some distance from the fret’s position. I suspect you can do the same with a guitar. Meanwhile, our band features another instrument that has fully movable tips that bridge the strings, and it is re-tuned between numbers. Take a look at the Guzheng! One style of playing reminds me of the steel guitar. That article mentions “Experimental, atonal pieces have been composed since the 1980s” as well. Also, note that this instrument facilitates microtone playing by pushing on the string on the other side of the bridge. This does not act as a fret, but adds tension to the string. It’s used commonly for a viberto effect, but she can be seen doing it on a couple notes besides that — presumably to get a sharp or other note that there’s no string for. It may depend on what type of guitar you want this for. On an electric with a bolt on neck, it probably would not be too hard. You may have to commission a lutherie to build you such a neck, maybe the CAD drawings of such a neck already exist, who knows? If they do not exist it may take a fair bit of expense and coercion to get your lutherie to commit to such a project. To pay a hundred dollars for some drawing of an already proven concept is one thing, but to develop this with no way of really knowing if more than one person is ever going to be interested in the concept is going to be hard to justify. Maybe you find that the first luthier you contact about this is so intruged by the concept that he decides to make it his life work to build such a guitar, just dont count on it. In my experience luthiers are purists, they are set in their ways. The want to build their guitars. They tolerate the things people pay for because they do need a certain amount of work to survive, but only to a point. Contact your local lutheries and see what their response is, maybe your experience with them is totally different than what mine is. Maybe your luthier has the policy of willing buyer, willing seller, again who knows? If you do not find a person who shares your vision then really consider becoming a luthier yourself. This so sounds like a Herman Hauser-esque anecdote that is just 30 years away from completion? When to level/replace frets on an electric guitar?